Australian poet Vanessa Page’s latest collection, Confessional Box, is equal parts personal and critical, examining emotional relationships with a terse, engaging style. 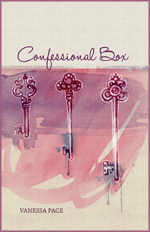 As the title suggests, there is a strongly self-aware element to Confessional Box. The poems are relatively open, encompassing a range of points of view and personas, but these are not wholly simple reflections of human relationships. Rather, Page presents a series of evolving sections, embellishing on memories and balancing broader criticisms against more personally orientated notions of access and invitation. This mini issue is a poetic conversation between a source poem and ten poems found from within its lines. It’s a refraction of language and image through poetic prisms, an intersection of the familiar and unfamiliar, blurring the edges through the 11 authors’ interpretations.